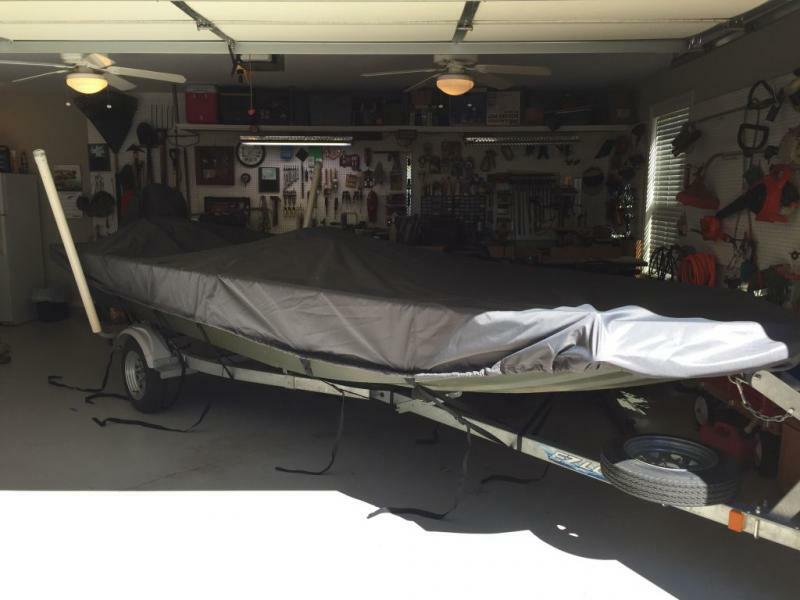 I decided to get a cover for my Alumacraft 1648 MV this fall. I normally keep the boat in the garage, but wanted to be able to store it outside when I have a wood working project going in the garage. I have had 2 custom covers made in the past for boats, but didn’t want to spend the money for a custom cover for my tin. I bought a cover from one of the big box sporting goods stores a few years ago and the fit was so terrible I never used it. I thought I would give one of our site sponsors, Boat Covers Direct a try. I checked out their website and had a couple of questions. I called Customer Service and a nice lady with English as her first language actually answered the phone. She was very knowledgeable and polite. I placed my order for a Carver 7oz. Sun-DURA cover on Saturday on line and received it on via FedEx on Tuesday. Shipping was free. I noted that I was a TinBoats member and received a 10% discount. I finally got around to installing it today and was very pleased with the quality and fit. It came with a tie down strap kit and a carry bag. I have not trimmed the straps yet as shown in the picture. I think I will make 3 support bows before I trim them. The product, in my opinion, is a very good value, the Customer Service was great and the product is made in the USA. I have a generic fit Carver cover for my 15' Klamath and agree with your comments. They are very nice covers for the price. Mine didn't come with a carry bag but it does cover my outboard which is nice. I have been using a couple of poles with long-wise strapping to support the cover when it is raining. Works well but kind of a pain to set up. I think I'm going to swap that out for some PVC pipe support bows like you mentioned in your post. Looks like our first decent rain storm since last April is happening later this week. Might be a good excuse to make the PVC pipe supports in the next day or so. We are thrilled to hear (and see) the cover is working so well for your boat! It's so nice of you to take the time to share this feedback of our company and your new cover! If you need a support pole, feel free to contact us again and we're happy to get one out to you! Awesome! Thanks for supporting those that support us! I appreciate it very much.